High fives happen when good things happen first. This week, there have been plenty of high-five-worthy moments for the Cardinals, including last night’s 5-2 victory over the Miami Marlins. Let’s look at some of those celebration-inducing moments, shall we? High five for you, and you, and you … That’s a winner!! Right away, things fell the Cardinal’s way. In the first, thanks to a terrible play on what should have been a inning-ending double play, Yadier Molina stepped in with two runners on, and a two-run lead already. … make that a five run lead! Another Yadi Bomb sent three more runners to the plate, setting Kyle Lohse up perfectly for a seventh win. Line ’em up! High fives all around. Speaking of Kyle Lohse, he earned some props Tuesday night, too. Of course, when you enter the game with a five-run cushion, it tends to take a little pressure off! But, K-Lo held the Marlins’ lineup (mostly) in check, giving up two runs on four hits — one of which was a monster homer from Giancarlo Stanton. Talk about a no-doubter. That baby was smashed. But in true, under-rated Lohse fashion, he kept it together. For a ground-ball pitcher, there were sure a lot of warning track fly outs, but they were outs, nonetheless. He handed the ball over to Mitchell Boggs after 7.1. The moment of the night, though, may belong to Rafael Furcal. If you haven’t seen this beauty, go ahead. Watch now. I’ll wait for you to get back. … pretty ridiculous, right? “What a pick, and then the gun!” Dan McLaughlin said. And how about a 1-2-3 save from Jason Motte? It was kind of more a side-five-bro-hug from Yadi after locking down Motte’s 16th save on the year, but we’ll still count it. High fives for you, too, Jason! For the sake of balance, I’ll also point out that this was not a flawless game from the Cardinals. They scored all five runs in the first inning, and familiar foe Carlos Zambrano basically shut things down after that. The Redbirds managed seven hits on the night, four of which came in the first inning. In fact, Zambrano went through the fourth, fifth and sixth innings 1-2-3. The seventh was nearly trouble, after he walked the lead off man (which, of course, was Furcal in an “as so often happens” moment, after just ending the Miami threat with that double play in the sixth). After a Jon Jay single and a Matt Holliday GIDP, he intentionally walked Carlos Beltran, then unintentionally walked Allen Craig. That ended Zambrano’s night … and Ozzie Guillen’s too, as he had a few choice words for the home plate umpire as he walked to the mound to take the ball from his starter. Unfortunately, Molina hit a sharp grounder right to Hanely Ramirez, threat over. But, all is well that ends well, right? And for the fifth game in a row, this game ended with happy faces and, you guessed it, more high fives! This five game winning streak is the longest streak of the year (and, if I’m not mistaken, ties the longest winning streak of last season, too). With the Cardinals win and a Pirates loss, St. Louis is alone in second place in the NL Central, just two games back of the Reds. High fives happen when things are fun. And by all accounts, it sure looks like Cardinals baseball is fun again! Tonight, Joe Kelly — who, speaking of fun, said Monday’s game in which he had a pinch-hit RBI infield single was the most fun he’d ever had playing ball! — gets the start, looking for his second big-league win, and the second series sweep in a row for his club. Go get ’em, kid! I don’t often high-five, but when I do, I high-five with my right hand. 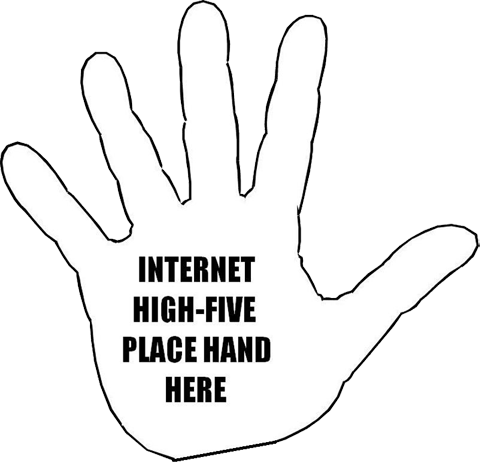 But when you high-five on the internet, it’s with your left hand.